Looking for the best running shoe for men that will help you walk on rocky trails and Climb Mountains like a Pro? You hunt ends here. Barefoot runner, rock climbers, and rocky trail lovers have to walk through the terrains as they struggle to balance on the ground. As a matter of fact runners and climbers need to keep a whole grip on the ground which is 100 percent possible with a barefoot walk but the pointed rocks would not allow the climbers and runners to walk through barefooted. In that case, wearing a comfortable pair of shoe is compulsory. What happens is that when you wear a comfortable shoe you stay easy but cannot cope with the grip need on pointy rocks. It is a unique shoe that has left behind the traditional look and design of commonly available running shoe and has introduced a unique set of features specialized for runners and climbers on challenging trails. The shoe has been made of polyester and rubber materials. The polyester used in the making of mesh upper and other components in the shoe whereas durable rubber has been used to create a sturdy, flexible outsole for increased grip and traction. The shoe has a low profile design with the forefoot area having the separate finger-box structure and the upper has the bungee lacing for a customized foot grip and fitting without exerting pressure on the foot muscles. The outsole has been given the wave grip design for increased grip on the ground. As the shoe has been designed to keep the foot safe from all directions with the use of support provided by high-quality design, the shoe is breathable and keeps the fresh air flowing through the mesh upper. The unique feature of this shoe is that when you wear it feels like it has cradled your foot and when you walk with it you feel or can grip on the ground and rocks like you are walking on them barefooted. But its mesh midsole and durable rubber let your feet stay rock proof no matter how pointed they are. You can walk and stay easy all the way no matter where you walk. You can use them for climbing rocks, walking on stones, rocks or muddy areas, you will find them a better companion of your feet. It provides sufficient grip on multiple kinds of ground surfaces. Due to its five-finger design, your foot will adjust its posture and grip as you walk through the stones and pebbles so that you will have the grip you need without letting your feet get dirty or harmed. You will know where you are walking and how you may adjust your gait to cope with the changing ground surface. Keeps the foot comfortable and easy no matter where you are walking and how much you walk on any kind of ground. Gives a barefoot feel so that you enjoy more and worry less while it keeps you away from injuries and avoids issues people find while climbing on hard trails. Your foot stays sweat free and dry as it offers enough airflow to its inner side. The materials are good enough to withstand various damaging situations and give you long-lasting performance. Perfect for climbing, running, and regular walk. Allow easy fitting and is easy to wear due to the quick put-on and take-off process due to the bungee string that adjusts to the foot easily. You just have to make sure that you buy half size up if your toe or whole foot is wider or bulkier than usual to adjust it easily. Customers need to have a shoe that satisfies their needs to stay easy during the walk or running on trails having bumpy ground and rocks. The shoe makes sure to match the needs of the runners and climbers who need a shoe that will offer grip on the ground and keep their feet away from getting injured due to rock slips and rock point pokes. Hundreds of customers have shared their positive feedback and experiences online and more are coming in continuously. 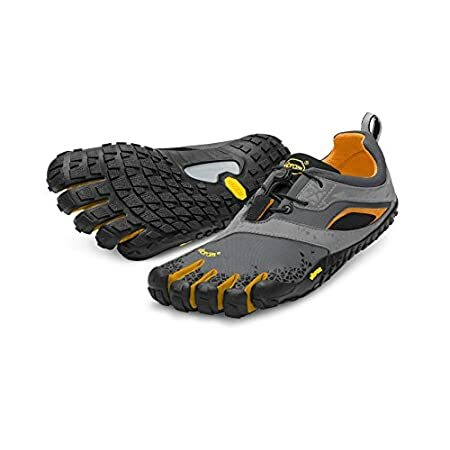 Vibram is one of the latest models of the comfortable and innovative shoe design that has attracted many runners and climbers to wear it for their routine practices and tasks. It has proven its worth as being one the most innovative technology for keeping the foot easy and active and enjoy the walk no matter how hard is the ground. The five-finger design and sturdy grip sole are the most prominent features making it perfect for rock climbing and running with a better grip on it. Anyone looking for a snug, comfortable and unique running shoe would love to wear it for sure.